The flag of Exeter College of Oxford University is seen at the college home page also shows the arms and the flag. 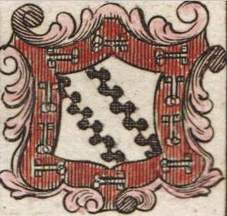 A large image of the arms can be found on the first page of the pdf file at http://www.exetercollege.net/design/pdfs/Exeter_Register_2006.pdf, which contains an article by Patrick Dickinson, Richmond Herald of Arms, about the subject p. 50-52 (dated 1969). His blazon: "Argent two bendlets nebuly within a bordure Sable charged with eight pairs of keys addorsed the bows interlaced and the wands upwards Or". Dickinson mentions a version impaling Stapeldon and Petre, a refounder of the College, but the simple version is preferred. An old rendering can be seen at http://www.heraldryshop.biz/catalogue/tobaccocards/wills/willsoxcam_clip_image026.jpg. The flag is a banner of arms (ratio 1:1). The College was founded by Walter de Stapledon Bishop of Exeter in 1314. It was known at first as Stapledon Hall. The College uses Stapledon’s arms. The keys refer to the founder’s Bishopric of Exeter, in the arms of which two gold keys are shown in saltire. Source: John P. Brooke-Little: Oxford University and its Colleges, Oxford 1962(? ), available online at https://www.theheraldrysociety.com/articles/oxford-university-and-its-colleges/.